• Custom tuning port sits low in the cavity to promote a high launch, and is made from a thermoplastic elastomer to soften the sound and feel at impact. • Stabilizing bar is low in the cavity of the long irons to launch the ball higher with greater ball speed. The shorter irons have a wider stabilizing bar for a lower ball flight. 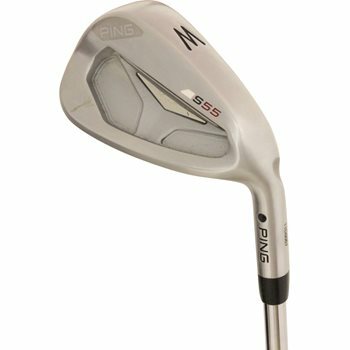 • Tungsten toe weight stabilizes the face for increased forgiveness and accuracy. • Brushed Satin chrome 17-4 Stainless Steel clubheads. Engineer and inventor Karsten Solheim got his start as an engineer working for GE in Ithaca, New York. His passion for the game set him on a journey to create a better putter. At the time he thought he was simply building it for his own personal use, but in 1959, Karsten’s ongoing garage experiments yielded an innovative putter he called 1A design. This putter had very distinctive design qualities, among them, a unique tone at impact, a sound that would echo throughout the game for generations to come…“Ping.” The Anser putter began a long and proud history of truly innovative equipment design throughout Ping’s entire product line (ultimately resulting in over 400 patents) that has set Ping at the top of the list of golf design and manufacturing companies. The company is headquartered in Phoenix, Arizona. Karsten Solheim has passed away and his son John has taken the helm.